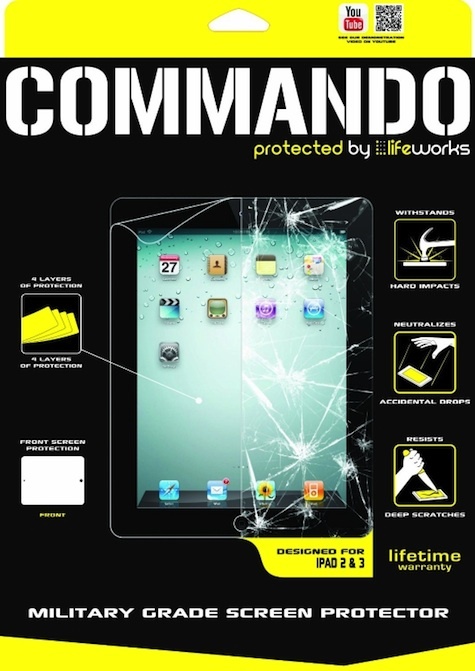 Commando is a military grade screen protector. The product consists of a polyurethane film, a durable material developed for military use. The original use was in protecting helicopter rotor blades from abrasive desert sand. The You Tube video demonstrating the ability of an iPhone protected by Commando to withstand the impact of a hammer and scratches from nails is dramatic. A quick review of customer comments revealed many testimonials of how going Commando is the best method to protect an uncased iPhone. The Commando screen protector has four layers of protection: scratch resistant, shock dissipation function, shock absorption, and silicon adhesion. The scratch resistant property includes a self healing capability. Surface scratches on the screen protector miraculously disappears. Shock dissipation and shock absorption protect the phone from regular daily impact. Hence, the limited lifetime warranty which includes a disclaimer that the screen protector is not indestructible. Drops from less than tested heights on non-smooth surfaces may lead to a damaged phone. The package includes a front screen protector, squeegee, micro fiber cloth, and instruction manual. The micro fiber cloth is used to clean the phone. The dry adhesive allows easy placement of the film on the phone screen. The squeegee is used to smooth out bubbles from under the screen. Instructions indicate that in 24 hours most bubbles will go away. Unfortunately, as indicated by most critics of Commando, the bubbles under my screen did not disappear. Bubbles are the only criticism I have of Commando. The thickness of the film does not affect usability of the phone. Anyone considering going without a case should consider going Commando.